Cat Friendly Practice® team members are trained in feline-friendly handling which makes a tremendous difference in decreasing the stress and fear during the visit. Cat-Friendly Attitude – The veterinary team is trained to speak softly, avoid direct eye contact with your cat, and move slowly. They know these actions help keep your cat calm and feeling in control. If any team member sees your cat becoming stressed or anxious, they will pause the check-up, let your cat take a break, and resume when she is calmer. 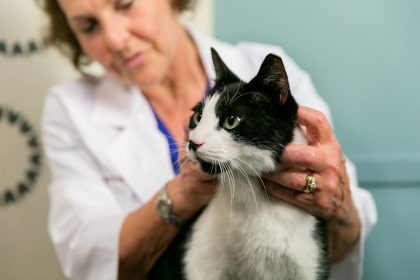 Educated Staff – Each Cat Friendly Practice® has at least one Cat Advocate who ensures all team members are trained to understand and handle them gently and respectfully. They can answer all of your questions and explain the specific cat-friendly features at the practice. Gentle Handling – Team members use a “less is more” approach when examining your cat, without using heavy restraint which could frighten, stress, or arouse your cat . Your cat’s check-up may take place on the table, floor, or in the veterinarian’s lap wherever your cat is most comfortable. 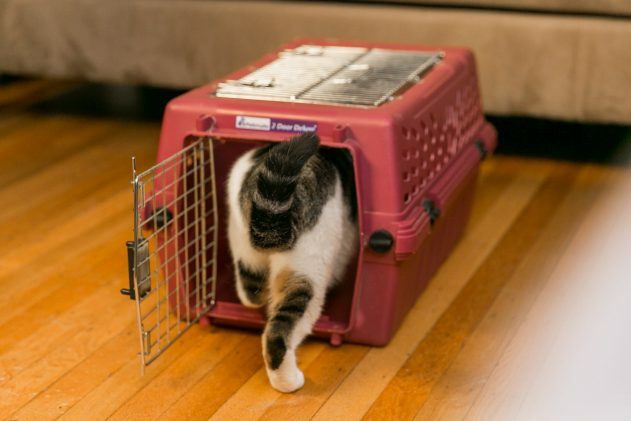 Advice – Cat Advocates provide you with feline-specific tips, like how to get your cat comfortable with the carrier before the visit. They can also advise you on how to transport your cat to the veterinary office in a way to reduce stress associated with the visit for both you and your cat. Gentle Handling – Team members use a “less is more” approach when examining your cat, without using heavy restraint which could frighten, stress, or arouse your cat. Your cat’s check-up may take place on the table, floor, or in the veterinarian’s lap wherever your cat is most comfortable. All Cat Friendly Practices® must meet certain physical requirements to receive the designation. 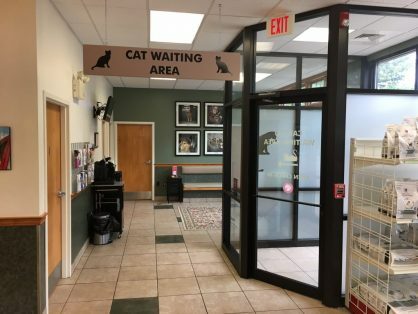 Waiting Area – Each Cat Friendly Practice® has a waiting area just for cats or an alternative to decrease waiting room stress (i.e. cat-only appointment times, bringing your cat right to the exam room, etc.). This allows your cat to stay away from the sight, sound, and smell of other animals. Cat Friendly Practices know these can cause anxiety for cats. Cat Comfort – Look for areas off the ground where you can place your cat carrier; towels to cover the carrier; separate cat entrances and resources; soft mats or towels on exam tables are a few examples of special enhancements many Cat Friendly Practices® offer. Hospitalization and Boarding Areas – If your cat needs to stay at the practice for a longer period of time, Cat Friendly Practices® ensure they are as comfortable as possible. 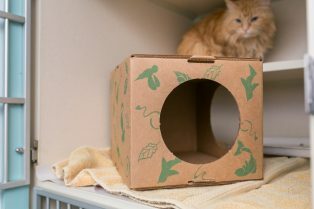 They have soft bedding and “safe havens” or hiding spots where your cat can retreat to feel safe. These types of features help reduce your cat’s stress while she is hospitalized or recovering from a procedure. 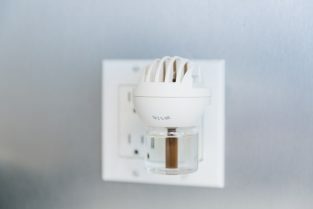 Scent Sensitive – Cat Friendly Practices® use a synthetic feline pheromone diffuser or spray in which chemical signals helps keep cats calm. 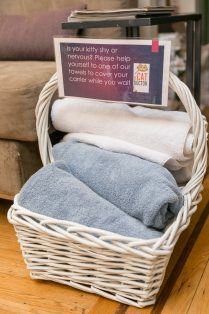 Look for diffusers in the waiting area or examination rooms, or for towels that have been sprayed. No Rushing – Cat Friendly Practices® know your cat needs time to get used to the new environment. So they do not rush your cat or the check-up. This helps keep your cat calm and allows the veterinarian to conduct a thorough exam. Cat-Specific Resources – Cat Friendly Practices® can provide you with helpful client brochures and educational materials on important health care topics. Examples include: How Do I Know if my Cat is in Pain, Your Cat’s Environmental Enrichment, Feline House-Soiling, Vaccinations for your Cat, and Getting Your Cat to the Veterinarian. Equipment and Facilities – Cat Friendly Practices® have equipment and facilities suitable for cats. After all, cats are not small dogs. Some of these areas include pain management, operating and anesthesia, dentistry, diagnostic imaging, and lab facilities. Comprehensive Care – Cat Friendly Practices® provide a thorough feline health care check-up. They will also leave the parts of the check-up that might be most uncomfortable for your cat until the end. This helps keep them calm throughout the rest of the exam. 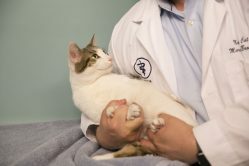 They will also spend time discussing other important topics for your cat such as a nutritional assessment, possible changes in behavior, weight, prevention, and healthcare plans. Here are some other reason why you should choose a Cat Friendly Practice®. © Copyright 2019 International Cat Care and American Association of Feline Practitioners. All rights reserved. Cat Friendly Practice® is a program conceived and developed by International Cat Care.